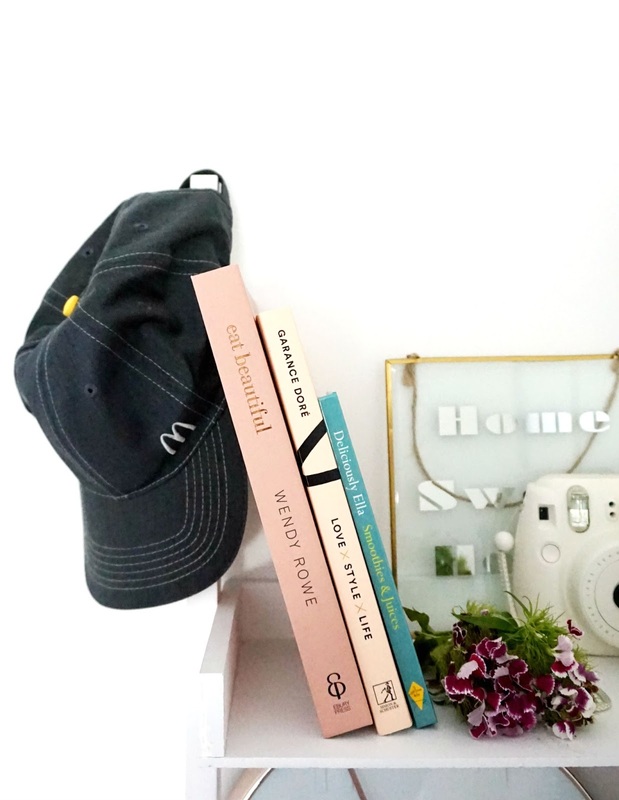 How McDonalds Has Ended Up On My Top Shelf... | H A Y L V O G E L.
There are so many things that come to mind as soon as you hear that name, in particular.. DELICIOUS! I was unbelievably excited to attend a McDonalds event last week at the Plymouth New George Street restaurant and be one of the first people to experience McDonalds restaurant evolution - and I can confirm very early on, you will definitely not be disappointed with how your McDonalds is about to look! Just when you think McDonald's couldn't get any better, BAM they invite you to come and see an exclusive behind the scenes with the chance to make my very own BIG MAC! Yes that's right, you read it correctly. Blogging life MADE. 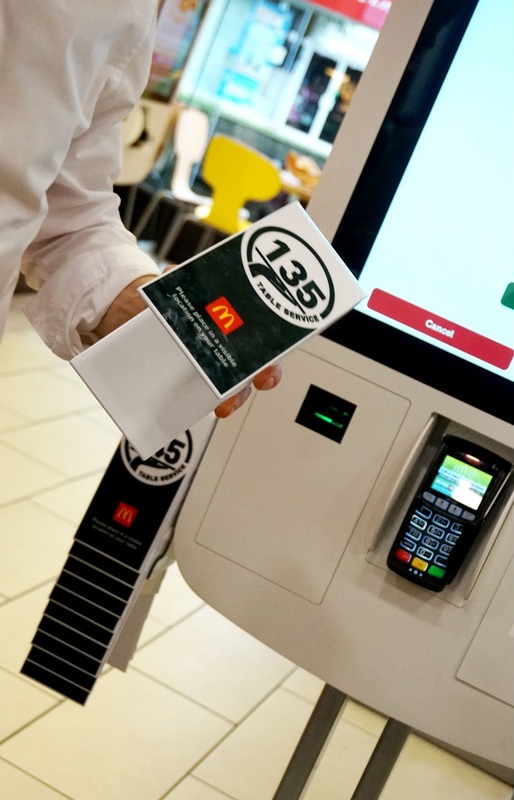 As you know the times are ever changing and the demand to keep up with the growing technology is crucial in any thriving business, especially in a multinational company such as McDonalds. We should be thankful as this has led to the amazing restaurant evolution that is going to be taking place across their 800 fast food restaurants in the UK and I was lucky enough to be amongst the few people to experience first hand the benefits of the brand new features that have already been installed in the Plymouth restaurant. I was thrilled to meet restaurant owner and business partner Dave Wynne, who is the franchisee of all the 12 stores around Devon and Cornwall. 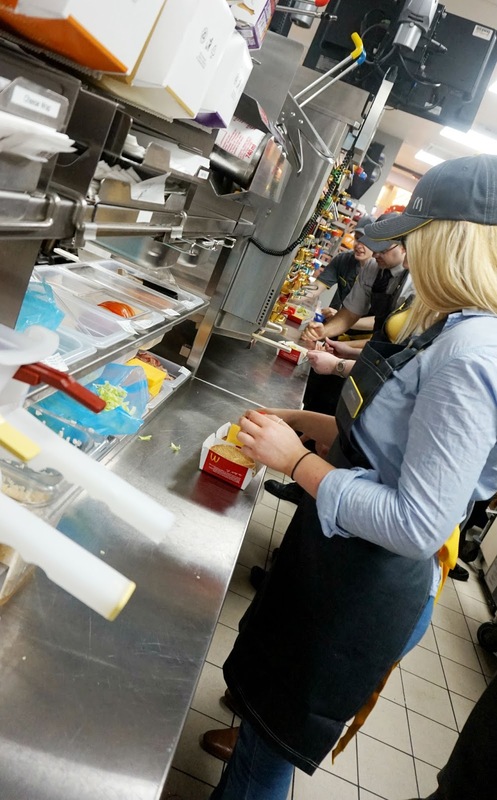 Dave gave us a tour of the kitchen, taught us the tricks of making the best big mac in town and let us in on all the new features that have already been established in over 500 stores in the UK already. As soon as I arrived I was made to feel so welcome, and all the staff were so friendly and helpful. I was shown upstairs to where our little table was set up ready for the arrival of everyone attending the event and I was able to chat to Dave while we waited for everyone. It was lovely to hear all his experiences, and he knew all about Cardiff which was great! At the very start of the tour Dave took us into the staff room where we were given our very own McDonalds apron, hat and our own personalised name badge! I was so touched with how personal everything was and I was so thrilled with my outfit. Definitely will be sporting the hat and apron next time we have a summer BBQ, I know the trick to making the best burger now after all! Self Service Kiosks - This is something you might have already experienced using, I know before I attended the event I was familiar with this set up but I didn't fully understand all the technical advantages it offers. It's perfect if you're in a rush and just want to pop in and out without the hassle of queuing and having to read out your order to the person serving at the tills. In particular when starting the session there is an option on the right hand side which enables the screen to be lowered, making it accessible to wheelchair users and small children wanting to get involved with the ordering. You simply click the button and it brings the touch assist options down to the right screen level allowing everyone to use the service with ease - such a fantastic feature. Not only does it have this feature but the screen is also available in a number of different languages, something that comes in handy if you're visiting the UK from abroad or if you simply prefer to order your meal in welsh you have the option! 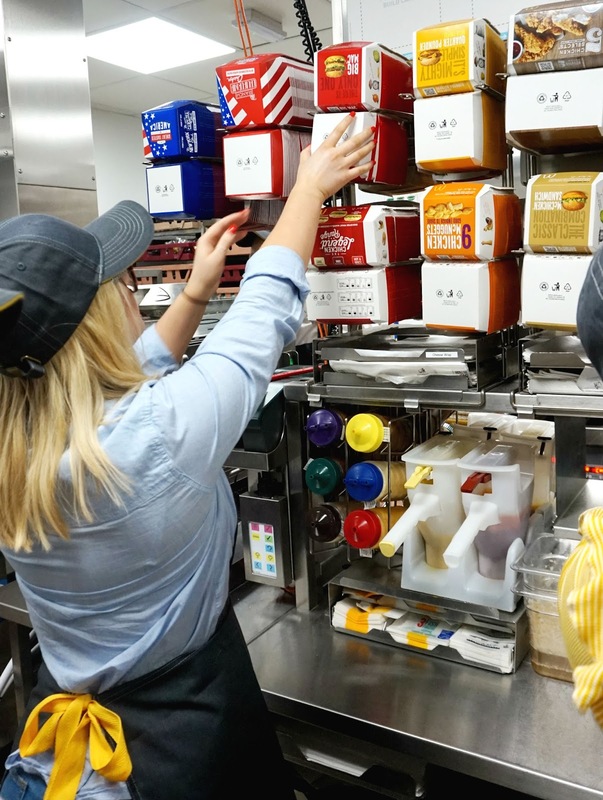 It's also designed to make your whole McDonald's experience personal to you individually as you're able to customise every item to just how you like it. This is something I LOVE as I'm a bit of a weirdo when it comes to ordering food, liking very specific things... such as a plain just cheese big mac meal.. *side glance eyes* so this feature is perfect for ordering the meal of your dreams. They really have thought of everything! Table Service - This was something that really blew my mind! I couldn't believe what I was hearing when Dave explained! Yes that's right everyone, you heard it here first.. McDonalds are now offering TABLE SERVICE and will deliver your meals to your seat and you won't even have to move a muscle. Amazing?! I think so. With the upcoming expansion it was only right to include this service and I can imagine it's going to hit the fast food industry by storm, soon we won't have to lift a finger and a fabulous chicken nugget meal with appear right in front of us. All you have to do is place your order using the self service kiosks, select the option of table service or collection (you can still queue up and collect your meal manually if you're on the go or in a rush) and you pick up a table number sign from the side of the machine, type the number in and your food will arrive after it's been freshly prepared piping hot straight to your chosen seat! Free Internet Tablet Use - As some of you might already know, McDonalds offers free wifi use to all there customers when visiting the restaurants, something which is very handy these days! When you just want to have 5 minutes to yourself checking your emails, you can now take full advantage of the tablets on offer. There's a little area to the side of the restaurant where there are 4-5 tablets which have access to your emails, facebook, twitter, the news & all the new gossip of McDonalds news. I'm sure you can agree, this is SO handy! You don't have to drag your heavy laptop around with you everywhere to enjoy the internet. Another little handy feature is that after 10 minutes it refreshes and logs you out.. so you don't need to worry if you forget to log out of your facebook - tick from me! Revolutionised Kitchen Design - This is one of the BIG ones, and is also the place I found most impressive. There are so many different rumours about whether or not McDonalds use fresh delicious ingredients. From ever since I can remember, especially when I was in primary school, all the kids use to love telling each other that the chicken nuggets contained brains and feet - and the funny thing was, we ate it all the same! Obviously this isn't the case, but actually going and visiting the kitchen really opened my eyes to how clean, professional and speedy the kitchens really are. We were taken right into the thick of the busy working kitchen, big thank you to all the staff trying to put together all the orders while we were oo'ing and aarr'ing at all the amazing features. The efficiency of the kitchen was very apparent and it's clear they can't really have anything but. 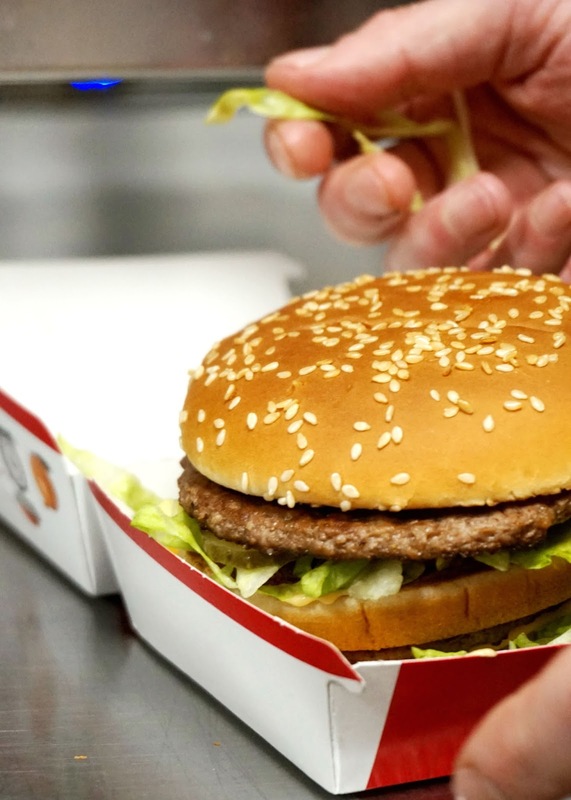 The kitchen is so busy, priding themselves on being able to put together a whole big mac meal in just 55 seconds from the time the orders processed! Another amazing fact is, everything is prepared FRESH just the way you've ordered it. As soon as your order appears on the screen that is when it's prepared. Dave explained that they previously kept the food warm in holding bays for around 10-15 minutes and waited for the orders to come in, however, that's completely changed and everything is made to order. Something we all found really impressive, as you don't expect that from such a busy environment. They've really got the perfect production system going and they've mastered the art of big mac making like no other. Everything they need to prepare the food is all lined up, neatly which gives them the easiest and quickest method of preparing your meal. From the toasting of the buns to portioning the gherkins so you have one in every bite, the kitchen has everything you need! There's a little food shoot in the center so when the food is ready they pop it down the shoot and it slides to the front of house and is distributed from there - it reminded me of Charlie and the chocolate factory when the squirrels are preparing the nuts, so cute! Fresh Ingredients With Every Bite - As touched upon in the last bullet point, fresh ingredients is at the forefront of McDonalds. Speaking with Dave and the staff in the Plymouth store it was so clear to see that they all shared a passion for what they do and preparing fresh ingredients is very important. This was shown in the kitchen with the 100% chicken, beef and potatoes used to make the chips. The burgers are prepared with salt and pepper only nothing else is added to them during the cooking process. You can take a look at the FAQ's to the food to find the full list of information! This was also something I experienced myself when I was making my own Big Mac, everything I used was fresh and hot off the grid. Recycling, Charity & New Ideas - McDonalds have always made sure charity was an important part of the business, including the Ronald McDonald house charities scheme for years. As well as the bigger international charities, each local store has there own schemes to give back to the local community. For Plymouth in particular, Dave mentioned they often sponsor children's sport teams supplying them with the funds they need to provide uniforms & the correct education needed. During our time wearing the McDonalds uniform, we found out that every single old uniform is recycled and turned into brand new. They have an incredible recycling policy and make sure that every delivery truck that comes to the store returns full to the brim with recycling materials saving any extra trips that need to be made, which in time cuts down on the pollution the lorries give out into the environment. They really have got everything covered! All in all, I couldn't have been more overwhelmed and happy when finishing my tour and event and I can imagine you are just as impressed too! I had such a fabulous time seeing for myself the love and hard work that goes into the production of every McDonalds meal. I felt so welcomed and it was great to meet the man behind a lot of the new features happening to a McDonalds near you! 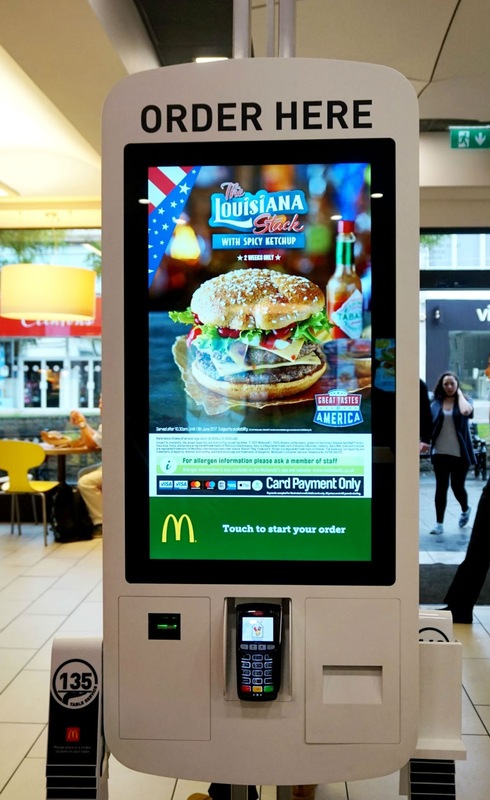 It was clear from the start that the new features are all there to make the McDonalds experience the best it can be, having a choice in the food you order and how you order it. Have you seen any of the changes yet? Perhaps you ordered a single slice of cheese with the new self service kiosks.. yes that has been done! I hope you've enjoyed seeing what's to come for McDonalds and you, it's going to be fab. They've had the self service kiosk things here in New Zealand for awhile now and it's my favourite thing ever!